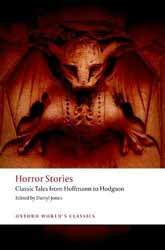 Oxford World’s Classics publishes Horror Stories – Classic Tales From Hoffman to Hodgson, an anthology of genre short stories from between the period 1816 to 1912. There are 29 tales encompassing ghosts and the supernatural, psychological, medical, colonial, and scientific horror, plus the uncanny, and precognition. It is edited and introduced by Darryl Jones, Professor of English and Dean of the Faculty of Arts, Humanities and Social Sciences at Trinity College Dublin – where he teaches 19th Century literature and popular fiction. His previous collections include the recently reviewed Arthur Conan Doyle: Gothic Tales, and M.R. James – Collected Ghost Stories. This book also incorporates Notes on Text, a Select Bibliography, and a Chronology time-line. A collection of old horror stories is always welcomed with open arms by me, if no one else. For the casual curious reader this is an ideal manner in which to example various writers and differing writing styles. I should point out, however, that because these are from the late 19th century and very early 20th century, they do confirm to a formal retro style. They are invariably told by well-to-do or blasé rich men. The stories are relayed from what one person has told another, rather than the action happening in real time as we read. People born in the 21st century may consider this material stuffy and long-winded, while at the same time enjoying a modern film version of the tales. I for one love this format, and possess leather bound collections of such authors as H.P. Lovecraft, M.R. James, Edgar Allan Poe, Mark Twain, Arthur Conan Doyle, Robert Louis Stevenson, and many others. Consequentially, I have read many of the stories presented here already. People’s opinions are obviously going to differ, but I often wonder at the choices of stories selected from writings in the public domain. Many anthologies will want to include all of the most popular stories. Indeed, this one has 'Strange Event in the Life of Schalken the Painter' – by Sheridan Le Fanu; 'The Signal-Man' – by Charles Dickens; 'The Body Snatcher' – by Robert Louis Stevenson; 'The Yellow Wallpaper' – by Charlotte Perkins Gilman; 'The Case of Lady Sannox' – by Arthur Conan Doyle; 'The Monkey’s Paw' – by W.W. Jacobs; and 'Count Magnus' – by M.R. James. However, there are also nice examples from those horror writers from the period who are often underrepresented in modern collections: Arthur Machen ('Novel of the White Powder'), Algernon Blackwood ('The Wendigo'), and E.F. Benson ('The Room in the Tower'). Of course, other famous names can’t go without a mention, and these are undoubtedly used to pull in potential readers. We have Bram "Dracula" Stoker’s 'The Squaw', Rudyard "The Jungle Book" Kipling’s 'The Mark of the Beast', and Edgar (too many to mention) Allan Poe’s 'Berenice – A Tale'. There is nothing wrong with selecting any of these classic writers, but often the same stories are chosen in different collections to represent them. Therefore, connoisseurs of this period, such as myself, may well feel cheated by receiving only up to half a dozen titles they haven’t already got in other collections. Nevertheless, I look on this release – like many other anthologies – as serving a purpose to show the world how these are, not only examples of early sub-genres copied today, but that they still have an impact in their own right. I am disappointed, however, that H.P. Lovecraft – undoubtedly one of the best horror writers of all time – is not included here.